﻿ Q294: How can I integrate Planyo with my Expedia Partner Central? FAQ Q294: How can I integrate Planyo with my Expedia Partner Central? If you have an account for your property at Expedia and you want to integrate it with Planyo, you can use our Expedia Integration extension. The extension will synchronize the availability between Planyo and Expedia. Availability of rooms in Expedia will be imported from the associated Planyo resources (see Potential issues below). On the other hand, all reservations made in Expedia by your customers will be exported with complete data to Planyo and will get a Planyo reservation ID. This way, you can have access to all reservations in one place, whether they were made in Expedia or in Planyo. This also allows you to have only a part of your rooms assigned to Expedia while the rest is available to your customers only through your web site. 1) Login to Expedia Partner Central. Next, navigate to the the Rates and Inventory tab and select Expedia Quick Connect Settings. Select Planyo from the list of supported vendors, select the Connectivity Options (AR, BR) and click on Submit. 2) or download this form and fill out the section 'Hotel Contacts and Details' with the information about your property. Please leave the prefilled Planyo provider data in the second section untouched. When you are done, send the file by e-mail to eqchelp@expedia.com or by fax to +1 425 329 3648. Once Expedia turns on your hotel connectivity with Planyo as the Interface Provider, you can continue with the setup process. Next, you need to turn on the Expedia Integration in Planyo. Once logged in to your Planyo account, go to the Expedia extension page in Planyo Store and click Buy as subscription. Then, click Go to the setup script to configure the integration. First of all, you need to specify your Expedia hotel ID so Planyo can access your property. Once this is done, the extension will download the list of your hotel rooms. Now, you need to do a matching between your Expedia hotel rooms corresponding Planyo resources. In order for the extension to work, you need to have existing rooms (resources) in your Planyo account that will correspond to your Expedia rooms. The extension will synchronize availability between Planyo and Expedia. Availability of rooms in Expedia will be imported from the associated Planyo rooms. On the other hand, all reservations made in Expedia by your customers will be exported with complete data to Planyo and will get a planyo reservation ID. You can add Planyo rooms in your Planyo account. Make sure the planyo resources are well set-up and note that their quantity will be the quantity available to Expedia customers (you can use the Max availability limits feature to easily change the number of rooms available in Expedia; you will learn more about this later in the tutorial). The planyo resources should also have the max. number of persons specified for each room. Now, you need to initially upload availability for your hotel rooms. Expedia requires that you have availability for next 12 months uploaded for your property. You can start the initial upload by clicking Upload availability on the setup page. Before you do this step you can set up the maximum number of rooms that you want to be available to Expedia. In order to set the availability limits, click Availability limits. At the top of the page, you can switch between your Expedia rooms to change their settings. By specifying a maximum availability limit, you can limit the room's availability in Expedia for chosen days, compared to the total quantity set in Planyo. The Max number of rooms available in Expedia (default) value applies to all reservation dates. Additionally, you can also modify the value up or down for individual days. If you don't specify any limits, either default or on specific days, the availability will simply depend on the resource's availability in Planyo. For example, let's say the quantity defined for a room in Planyo is 25 but you want to give to Expedia only 10 of the rooms. This way, customers reserving on Expedia will be able to take only 10 rooms while the rest can be reserved from your web site. In this case, you need to set the Max number of rooms available in Expedia (default) value for the room to 10. Click Default limit, type 10 as the default limit and click Update. This way, availability uploaded to Expedia for the room will never be higher then 10. Note that the values define the maximum availability that will be uploaded to Expedia. If you limit the availability of the corresponding resource in Planyo, e.g. by adding vacations, the number of rooms available to Expedia can be even smaller. The same way, you should setup the limits also for other rooms if necessary. Note that you can switch between the rooms by using the drop-down list at the top of the Max. availability limits page. Note: Some hotels have base availability amount established for their rooms in Expedia. This is the amount assigned to Expedia that cannot be taken back. In such case availability uploaded to Expedia for the room should never be smaller then the established base amount (with regard to any bookings already made). In such case, Expedia will automatically fix the uploaded value to the base amount. Note that this extension will only synchronize availablity and import reservations made in Expedia. In order to set up the rates and reservation restrictions for your rooms you will need to use Expedia Partner Central (EPC). EPC supports robust ways for bulk update of prices and restrictions. EPC allows you to set rates and restriction for a range of dates as well as for single days. 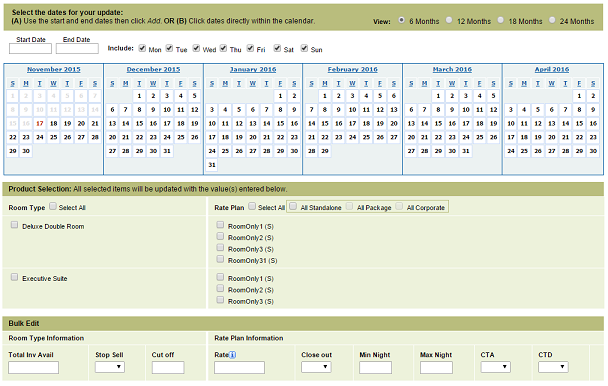 In order to update a range of dates, choose Rates and Inventory > Bulk update from the main menu. On the page, you can either specify the start and end dates that you want to update or use the calendar preview to select individual days. Next, in the section below you can choose if you want to update a rate or once of the restriction. Once you submit the changes, the data will be updated for your rooms. You can also change rates and restriction for individual days directly on the Inventory Grid page. Once you click a cell, a pop-up window appears where you can modify the data. Now that all is set up, you can upload the data to Expedia. Go back to the Setup page and click [Upload availability]. Once the update is finished, you can go to your Expedia PartnerCentral and check that everything is uploaded correctly. Note that this initial data upload needs to be done only once. From now on, all changes to availability will be updated on your Expedia account automatically (see Potential issues below). 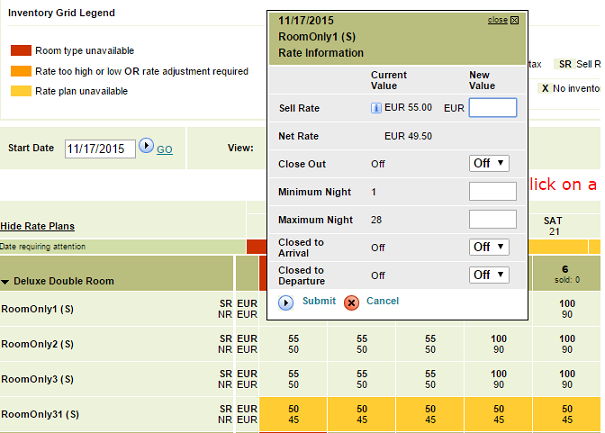 If you want to modify availability limits for one of your rooms, you can always do this on the Max. availability limits page. Once you submit the changes, the extension will automatically update the data on your Expedia account. Note that availability can also be modified as the result of changes made on your Planyo account. In such case, the related data will be automatically updated on your Expedia account as well (see the note below). For example, if you modify in Planyo a vacation of a resource assigned to one of your hotel rooms, the corresponding Expedia room's availability will be updated as well. When a reservation is made by a customer on Expedia, it will be automatically imported into Planyo and visible among other reservations in your Planyo administration panel. On the reservation's details page, you can view all information related to Expedia. This includes the due commission, guest name, smoking preferences as entered by the customer, their notes and special requests about the visit and all other details. Note that though the Planyo view allows making modifications to the reservation, this shouldn't be used for Expedia reservations. Whenever a customer is making a reservation at Expedia, they are sent a link where they can change the reservation's details. This includes changing arrival and departure dates, modifying number of persons or even rates. The changes will be automatically updated and visible in Planyo. Any modifications to the reservation made in the Planyo administrative panel will not be reflected in any way in Expedia. For example, if you cancel the reservation in Planyo, it will be still visible as valid in Expedia and all due commissions and fees will have to be paid to Expedia anyway. Expedia Partner Central (EPC) is the place that includes direct access for you to manage rates, financial details and processes, detailed information about your property as well as a number of other tools. 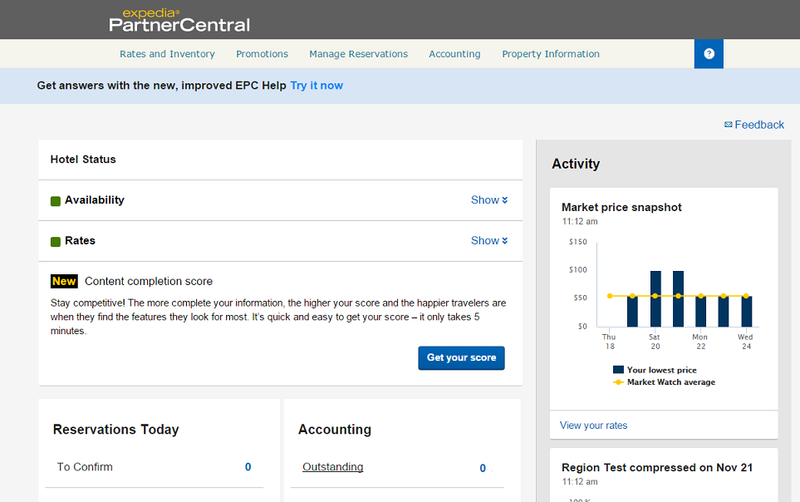 In EPC you can view detailed information about your reservations, including credit card or Expedia virtual card data. It also provides you with reservation statistics and accounting information. You can always visit your Expedia Partner Central to verify that the data uploaded by the extension for your hotel rooms is correct. There are some issues that you should be aware of when running synchronization between Expedia and Planyo. Some hotels have base availability amount established for their rooms in Expedia. This is the amount assigned to Expedia that cannot be taken back. In such case availability uploaded to Expedia for the room should never be smaller then the established base amount (with regard to any bookings already made). Our extension is not able to set the availability for such rooms below the contracted base availability (of course unless a reservation was made through Expedia). In such case, Expedia will automatically fix the uploaded value accordingly with the established base amount. This in some cases can lead to overbooking. This means that you should offer through Planyo only this number of rooms, that is not contracted with Expedia. For example, if you have 5 Double rooms set up in Planyo and you have contracted 2 of them with Expedia, you should offer through your Planyo web site only 3 such rooms. You can set it up by using packages. You can create a package containing the Double room, give it the quantity of 3 and offer it through Planyo. This way, your customers will be able to book all 5 rooms through Expedia but only up to 3 through your Planyo site. As mentioned, the extension will synchronize the availability between Planyo and Expedia. When there is a new reservation added in Planyo or when you enter a new vacation, the availability will be automatically updated in Expedia. On the other hand, if you change any configuration options in Planyo that could affect quantity of a given resource, please update availability of the assigned Expedia room manually. You can do this on the [Manual data update] page in the extension.